RANGOON — Even though she works at least 50 hours a week, she can hardly make ends meet. “They give me 75 kyat (less that 10 US cents) an hour. I can no longer survive on that meager wage,” said Ma Chaw, 26, right in front of the Tai Yi slipper factory in western Rangoon's Hlaing Tharyar Township where she has worked for the past eight years. There were hundreds of other young women around her; some were standing while others sat on the ground. It was late Wednesday morning, several hours past the time they were supposed to start work at the Chinese-owned factory, but Ma Chaw and more than 1,800 others like her were still outside the gate. In point of fact, they were on strike. It has now been more than a week since they left the factory's footwear assembly lines, demanding a doubling of their hourly wages to 150 kyat ($ 0.18) and an increase in their monthly bonus from 6,000 kyat ($7.50) to 8,000 kyat ($10). “Their ultimate goal is to get a raise in hourly pay. If they can get that, they can earn more from overtime work. That's what they want,” explained Pho Phyu, a lawyer who described himself as an “international labor law specialist,” who has been volunteering as a legal consultant for the striking workers. 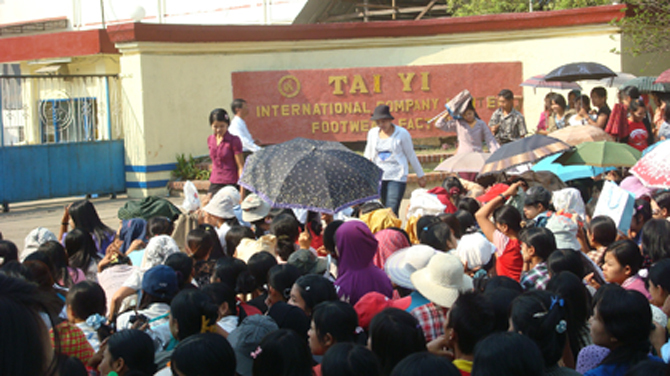 Emboldened by a new law introduced last year by Burma's nominally civilian government that legalizes labor unions and strikes, the Tai Yi employees started their walkout on Feb. 6 when the company refused to pay them for an unofficial five-day holiday to mark the Chinese New Year. It has since become the longest worker stoppage the country has witnessed in many years. The labor law says workers' unions are entitled to go on strike with the the approval of the Labor Union Confederation. But the lawyer said there are loopholes as well as restrictions in the law. “The government still hasn't implemented the confederation. The law excludes any protections for labor activists and procedures for organizing,” he said. A second round of negotiations between the workers' representatives, their employer and government labor officials on Wednesday ended in a stalemate. “The owner only agreed to raise the hourly wages by 25 kyat ($0.03). We haven't made any deal,” said one of the workers' representatives after the more than two-hour-long meeting on Wednesday. The result of the latest negotiation generated a roar of disappointment among the waiting workers. Some reacted in tears, some cursed the company. A woman sitting near the gate had no expression but sadness on her face. “I don't know what to do,” choked another woman in her late twenties, the eldest of five children in her family. Before the meeting, she was hopeful that the new pay would help her send money back to her family, according to her friends. “She hasn't been able to send money for several months because living expenses here are getting higher,” explained one of her co-workers. Most of the workers only make around 60,000 to 70,000 kyat ($75 to $87.50) a month, including overtime, bonuses and other cash benefits. But heavy penalties for mistakes or lateness—employees are fined if they don't show up at the factory at 7 am sharp—often impose a heavy burden on workers. Although low pay and severe penalties have long been a source of resentment, the final straw came last week when the workers learned that they had lost five days wages because of a holiday to mark the Chinese New Year, which is not officially recognized in Burma. “For the Chinese New Year holidays, they deducted 7,000 to 10,000 kyat [$8.75 to $12.5] from our wages. Every month, they manage to deduct something from our wages,” said Khaing Khaing New, 26, a female workers' representative. “I live on a very tight budget. I can spend no more than 300 kyat [$0.37] a day on food,” said a worker who sends more than half of her income back to her family in an upcountry town for her baby brothers' education. The factory's manager, Daw Aye Mi Khaing, did not respond when repeatedly contacted by The Irrawaddy for comment. Last year, a three-day strike for higher wages at the slipper factory ended when U Chit Shein, the director general of the Department of Labor, took part as a mediator in negotiations. But this time the workers on strike said they thought the senior labor officials on the negotiation board were taking sides. “They urged us to accept the owner's offer. One of them even said 'The employers are like parents. I have read the owner is ethnic Chinese. Anybody know who it is? I think it would help the workers cause to publish his /her name everywhere and label him or her a the tightfisted slave driver he or she appears to be. The owner of the Tai Yi should agree what the worker's demand. Because now, he lost over one week production. And Tai Yi owner is very rich. He can pay that amount. Must support to them strongly. Do China's businesses really need to further exploit Burmese people? I think the NLD should get involved and publicly show solidarity with the exploited workers. It's by-election time and it would be hypocritical for an opposition party to ask people to vote for them if the party doesn't care about the fate of the 99% of the population. I salute the Tai Yi factory strikers and along with them demand that they be recognized, honored and rewarded for their dedication, hard work and courage. The factory owners are like any capitalist enterprise squeezing what they can get away with from the workers who make them rich so that they and their stock holders can get richer off the workers sweat, tears and blood. I will be sharing the story of the courageous Tai Yi workers with my friends and associates and asking that they support this just struggle.